Are you tired of being in long-term pain? Are you recovering from an injury? Well, look no further, Bubbling Brook in Arvada is the place you’ve been searching for to receive caring, effective touch. Get started down the path to health. At Bubbling Brook, you’ll work with a highly-experienced, intuitive therapist who will spend time discussing your needs and then design an effective bodywork treatment just for you. Why choose Bubbling Brook Massage Therapy, LLC? The difference is this: In a world of 10-minute medical appointments and impersonal massage factories, you’ll be truly listened to here. 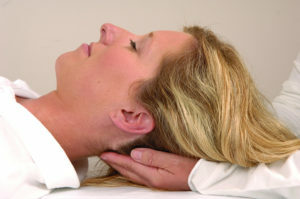 Myofascial Release is a safe, manual technique that involves applying gentle, sustained pressure into connective tissue restrictions to eliminate pain and restore motion. The slowly-applied pressure affects your connective tissue long-term, helping it to stretch and helping your whole body to eventually be more comfortable. Sometimes a fully-clothed 15 to 20 minute workplace massage is like a miraculous vacation. We arrive at your office with a comfortable massage chair and you simply provide space and let employees know about the service. The reward is huge: Employees are re-energized and their workplace satisfaction can skyrocket, contributing to higher retention rates. DT or neuromuscular massage can help you recover from an injury more quickly by releasing toxins and pinpointing areas relating to your injury that might need attention. Deep doesn’t have to be painful: DT can be customized for you. Choose a deep tissue treatment to help with knee issues, mid or lower back pain, shoulder or whiplash injuries. CST subtly balances your body’s cerebral spinal fluid and slowly stretches your connective tissues. It can help alleviate neck pain, headaches, lower back pain and more. Choose CST if you want a deep treatment without deep pressure or discomfort.